A short time ago--Dear Husbola and I attended an auction that appeared to have nothing too special on offer. We armed ourselves with the auction list and wandered around the sale rooms a couple of times looking for items to add to inventory. We are doing the Northern Illinois Antique Dealer's Association show in Rockford in February--and we need unusual inventory. 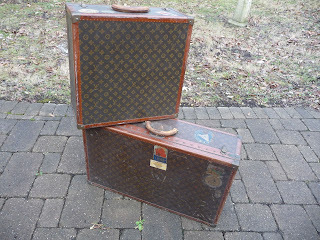 The auction was ho-hum--UNTIL I spied-- stuck under a table--three fabulous pieces of vintage Louis Vuitton luggage--one very large beat up trunk and these two treasures. Oh my. 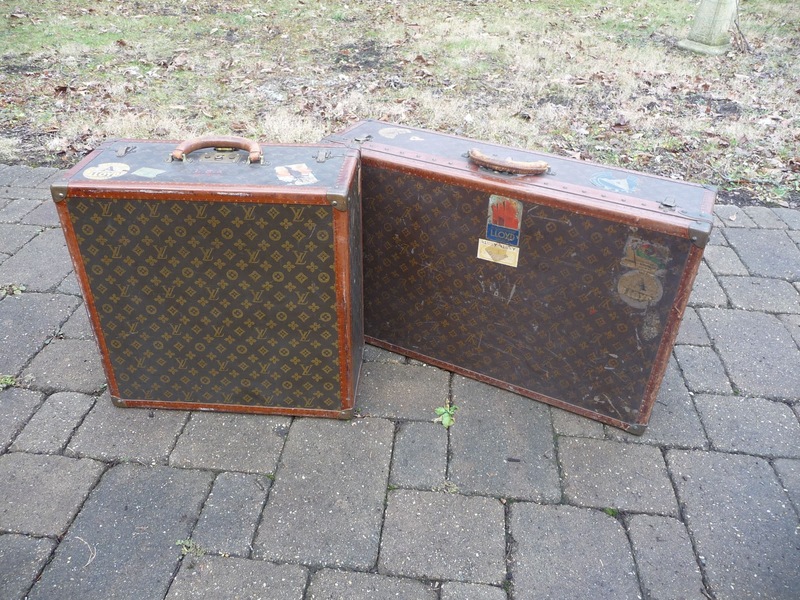 Real Vuitton luggage--each piece has a serial number--and if you want to--you can contact the company and find out details of the original buyer. These pieces are marked with red initials and the word Chicago. The inside of each has a label that indicates they were purchased at Marshall Fields. The insides are clean and not musty and clean. Circa 1920ish. 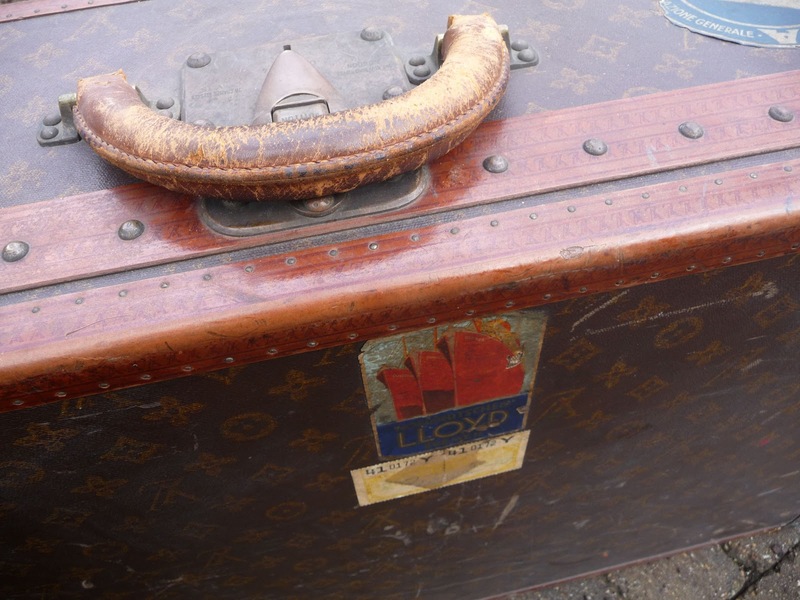 The patina on these cases in something you cannot buy. Rich burnished color to the brass fittings and the handles are warmly worn. There are remnants of old customs stickers and travel stickers. You just do not see these come up for auction--and certainly not in the midwest. I rarely say to Dear Husbola "I have to have it" about anything. There is always another neat thing that comes along. But--I said it and I said it in boldface type "I HAVE TO HAVE IT!" Yuppers. We bought the two suitcases. They were not sleepers and there was competitive bidding. No--we did not get them for a song - but they went severely under market price. No--they will not be at the February show in Rockford. Mais oui--they are going to live at our house for awhile. A long while. Dear Readers-Forgive the absence this month--as our room renovation project, otherwise knows as "the project that never ends" has been consuming us--has been taking a great deal of time. But this morning dawns warm for December--very warm--and Dear Husbola is going to futz with his bees and daffodil planting and I am off to beautiful Lake Geneva for an auction! Not just any auction--but an auction at a lakefront property. They seem t have some mid century things--and they appear a bit quirky. We love quirky--we SELL quirky. I am quirky. Therefore--off I go. More to report later. 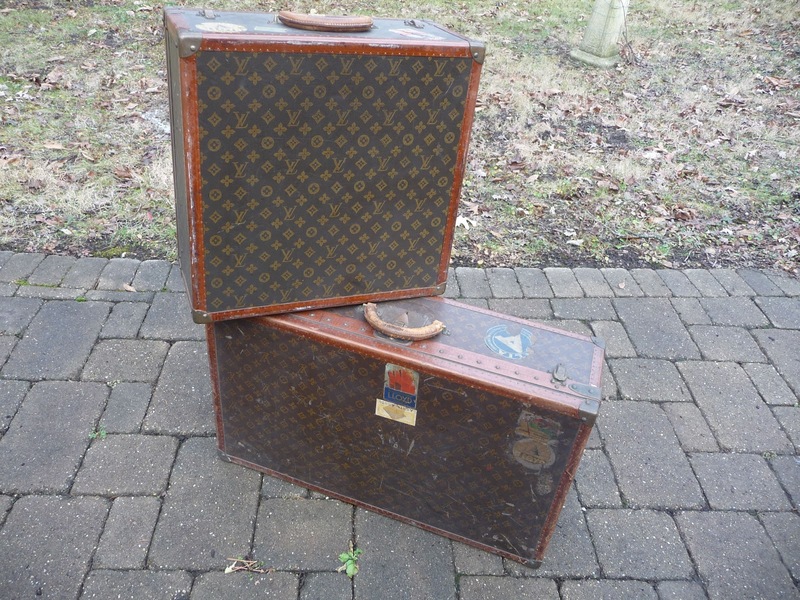 Plus--I have to tell you about the incredible 1915 circa Louis Vuitton suitcases I bought. And a set of incredible folk art plant stands. Good pickin's lately.